With Jurassic World right around the corner, we have seen quite an array of marketing take place. From theatrical trailers to television ads, toys, posters, and t-shirts; the presence of the film is becoming loud and clear. Fans should expect no less from a franchise that has always at least attempted to make a sting in our wallets with merchandise and collector’s items. 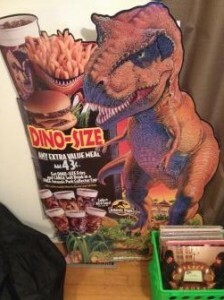 For the first film, Jurassic Park, the number of merchandising for the marketing of the film was astronomical. 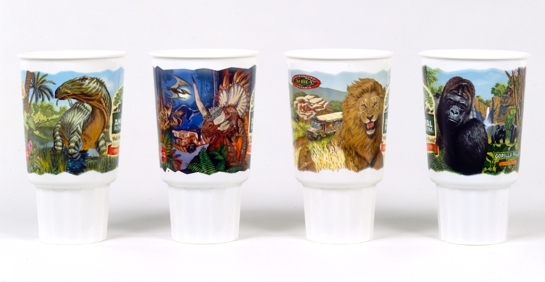 But one of the most fondly remembered items from that time were in the form of McDonald’s Collector Cups. 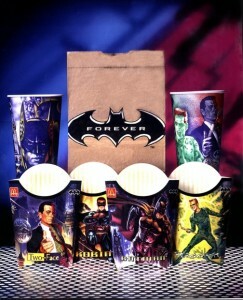 During the 90s especially, McDonald’s and other restaurants greatly participated in promoting films. Commercials advertising the cups dominated TV sets, along with many others. The cups themselves were free with every large drink you would get at McDonald’s. 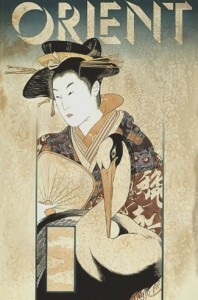 There were six of them; each depicting a unique scene from the film. The Tyrannosaurus Rex attacking the kids in the Ford Explorer; Dennis Nedry being cornered by the frightening Dilophosaurus; Alan Grant and Ellie Sattler tending to the sick Triceratops; Grant and the kids feeding and petting the cow-like Brachiosaurus with a family of Triceratops below them; a Velociraptor bursting through the glass at a terrified Sattler as another Raptor looks on; and Grant and the kids hiding under a log as a herd of Gallimimus are being chased by the T-Rex. All of them depicted in a realistic yet stylized way that, as Hammond would put it, “captured the imagination of the entire planet”. As a child, I would look at these cups and be completely mesmerized. It made me think of the film and the feelings and emotions that it generated through the visual designs. One has to remember this was at a time when movies did not come to home video right away. There was quite a long wait from the theatrical run to it’s eventual home video release. During that time, only television ads and the merchandise were able to give one any recollection of a film. So for a kid, such things were highly valuable for their creative nerve. They’ll always be a part of what the Jurassic Park experience is like. 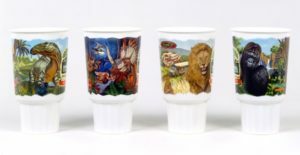 Joining us today is Mark Stutzman, the illustrator of these wonderful cups. You’ll get to read about some wonderful recollections of the process of how these collector’s items came to be; but also discover a taste of his other work and more about the man himself. You will also see, for the first time, two of the cups displayed in their full artwork, and a short write-up about them following the interview. I hope you enjoy it. Derrick Davis: What inspired you to have a career in art? Mark Stutzman: I’ve always had an interest in drawing and art as long as I can remember. All I would need is paper and pencil and I would stay busy for hours. I never really thought of it as a career until I was a junior in college. My art class had a student teacher come in and she talked about commercial art. A light went [on] as she pointed out all the uses of art in packaging, book covers, calendars, advertising, and even television. I was swept away by the idea of assignment work. Solving a problem with art just seemed like a great use for the skills I had worked so hard on. Derrick: What were some early jobs you had leading up to the early 90s? Mark: Up until the 90s I was getting local work from the Washington, D.C. area. It was the tech era, so I was painting a lot of computers, keyboards, and satellite dishes. I was considered an airbrush artist because it was the mode of the time that was popular. I had learned to use one in art school, but didn’t particularly care for the medium. It can be terribly technical and tedious. It got me work, however. Some of my favorite assignments were the work I did for the Art Director’s Club. They would host events such as portfolio reviews and the annual awards. I got to do some of their posters which were all gratis. That work allowed me to spread my wings and do work unlike any assignment work I was getting at the time. The best thing to happen at this time was I began to establish myself as a “poster artist”. I got a call to do a poster for the very first Star Trek movie. Unfortunately, this was prior to the internet so living on the opposite coast prohibited me from working on it. The tight schedule didn’t allow for shipping sketches and art back and forth. That was a huge missed opportunity! 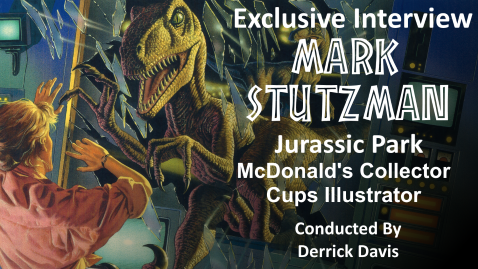 Derrick: How did you get involved with creating collector cups for McDonald’s, which led to the Jurassic Park line? Mark: My first project with McDonald’s was on a series of collector cups for the first feature length Batman movie [directed by Tim Burton]. 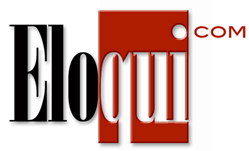 It was done at breakneck speed, but the beginning of a long relationship with the Chicago based agency who hired me. They were extremely behind schedule on the cup series and had a couple of missteps along the way. Their printer who was handling production of the cups was reserved for a particular time slot to accommodate the large volume that needed to be printed. I was told that for every day I missed the deadline, it would cost $100K to continue to reserve the facility! That was a lot of pressure, but was very motivating. 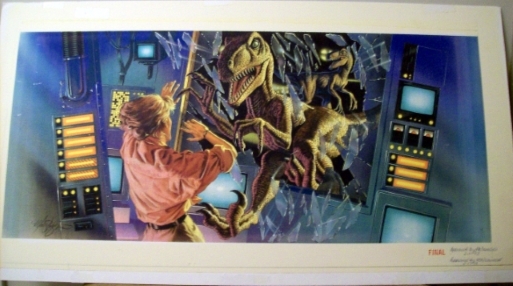 All got done on time which lead to several other cup series including the Jurassic Park commission. We had developed a nice working relationship and rhythm. 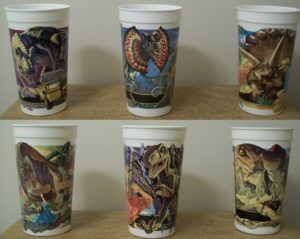 Derrick: What was the process of creating the different designs for the Jurassic Park cups? What did you have to use as references? Mark: The first thing McDonald’s did was fly me and the Chicago agency art directors/designers to Los Angeles to read the script and see the sets for Jurassic Park. Everything was very closely guarded. They wouldn’t even mail the script out. It was kept under lock and key so I had to power-read it in a conference room, make notes, and then head out for the studio tour. It was incredible to see. They showed us the Velociraptor puppets that looked completely realistic, even in person. The guide explained that the puppet was made out of a super pliable foam that would degrade over time. It was all carefully hand-painted and would allow a person to fit inside it. The head had glass eyes designed by a company that made prosthetics for humans. The teeth were made by a dentist! It was incredible! All of the facial movements were animatronics. Next we went to see the “wet set” where they filmed the scenes with rain or water. It’s a giant hanger that has a deep pool in the middle. It was surrounded by tropical plants and painted walls to give it a feeling of an infinite horizon. We then went to a large hanger that housed the T-Rex that towered over you. It wasn’t fully completed, but had the head and torso intact. The tour guide said when they were testing the animatronics, they lunged the head towards some people standing nearby and they nearly fainted from fright. It passed the test! Reference was limited to turnaround views of the sculpted scale model dinosaurs, artist renderings, and some stills from the dailies. I wasn’t allowed to take any pictures while on tour, so I could only sketch quickly since everyone was in a hurry. Derrick: How much of the film itself did you get to see in order to create your art? Mark: I was not allowed to view any film prior to working on the artwork. The script and still shots had to be relied on for the scenes as they played out. 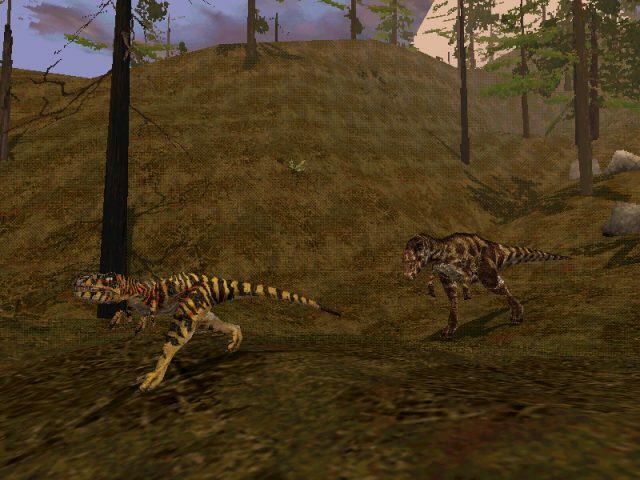 The Gallimimus sequence was completely computer generated so there were no stills of that to see in context of the film. Derrick: Was this process limiting you creatively or did they give you a lot of room to work with? Mark: Because time was limited, I managed to get all of the ideas loosely sketched out on my plane ride home. There was very little input or corrections to the ideas, just mostly fine tuning to make sure all the components of the film were touched upon. Derrick: Were there only ever going to be six cups, or were others planned but omitted? Mark: The series was always planned to be six in total. One directive was that they each carry some sort of color theme so they would be quickly distinguished from each other. Because they were a full wrapping design, each end had to match to the other end to give a feeling of them being continuous. I had my hands full with the six cups already, so I was not pining to do any scenes other than the ones that were required. Derrick: Out of all the scenes you depicted, which did you like the most? Mark: It’s a tough call, but it would either be the Gallimimus or T-Rex. The Gallimimus because it was with very little reference and mostly imagination. It was the most challenging. The T-Rex because it’s such a dynamic part of the film. The colors in it were fun to work out, too. Derrick: What was it like to see your designs on cups sold at McDonalds all over the country (possibly the world)? Did you buy them for yourself or did they give you a set? Mark: When you’re a commercial artist, the big payoff is seeing something in print. It’s always about the end product. I’ve always tooled my artwork to be print-friendly. Some things don’t reproduce well yet they’ll look great as an original piece of art. The agency I worked with were generous about sending me a sample of the final cups. I think I got about three sets which are all tucked away. I did some local signings at McDonald’s when they were released to drum up excitement about the film and to sell some burgers. Most of the collectors I met were in the early teens to twenties. I still hear from people who collected them way back when and have them in their private collections. 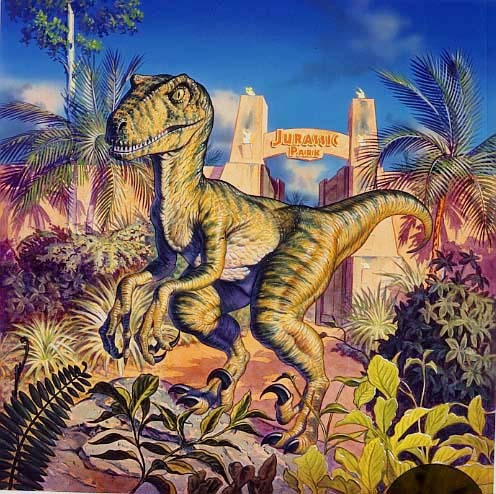 Derrick: You also did a big T-Rex standee for the cups and some other Jurassic Park-related art during that time; including a Raptor design for a plate. Could you describe what it was like working on those and their purposes? Mark: The standee for McDonald’s was part of their in-store display promoting the cups. It was an add-on once the cups were completed. I only have one of those. It was a fun project because it was exclusively the T-Rex, probably the most dynamic of all the dinosaurs in the film. The Raptor illustration was created for The Bradford Plate Exchange shortly after the movie’s release. They had planned on doing a series of each of the dinosaurs in the film, but after testing the product realized it didn’t fit their collector market made up of mostly middle-aged women. The project was abandoned. Derrick: Were you ever approached by Universal Pictures, McDonald’s, or anyone else to do any work for the Jurassic Park sequels? Mark: My work with the Jurassic Park property ended after this first film. Securing assignments is all about connections with the people who do the hiring. It’s nearly impossible to seek out work like that; it has to come to you. I put my work out there, but it’s not always seen by the right people to secure an assignment. Derrick: You mentioned earlier your Batman cup designs for McDonald’s. There were many others from around the same time period you did, including Batman Returns, Space Jam, and Walt Disney’s Animal Kingdom. Was the process of making those similar in execution? Mark: Each cup promotion I did with McDonald’s followed a similar path. I did get to visit the sets of the Batman films I worked on and was invited to see Animal Kingdom while it was being built. The timing was so tight that I was unable to fit in a trip and get the work done within the deadline. I have yet to see it. The most unusual work I did was for glassware. 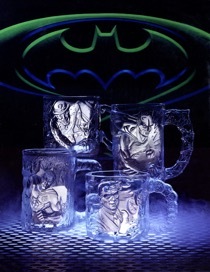 I designed Batman [Forever] and Flintstone’s glassware that was then sent to a sculptor for execution. It was exciting to see them become three dimensional, useable glasses. Some other premiums included french-fry boxes and a custom McRib box for the Flintstone’s Movie. Derrick: Do any of these companies ever give your original art back? What is the process like for these kind of deals? Mark: All of my work for McDonald’s is in their collection. They have amassed a huge volume of work over the years as you can well imagine. That would most likely not be the case today since original work is converted to digital files and sent electronically instead of shipping originals to be reproduced. It was accepted practice when I was doing the work for them but times have changed. It’s not unlike MAD Magazine whom I’ve worked with for a long time. Their early artists relinquished their originals and were hanging in their offices. They had an impressive collection by some key illustrators for that genre. They recently auctioned off the entire collection for a sizable sum. Derrick: With Jurassic World, the next sequel to Jurassic Park, coming out, it was revealed Dairy Queen will have cups that feature art designs based on posters made for the film. Their take is a photoshop approach compared to your cups. If you had been approached by them to do theirs, in that style, would you have been interested? Mark: Totally interested! I also have a greater understanding of the process of creating a cup series and would have loved to sink my dinosaur teeth into it. I’ve never worked with Dairy Queen, but I would have loved to have been involved. Much of the work you see now for films is cobbled together photoshop images. It does the job but not in the same way as artwork. Part of the dilemma now is these images need to be adapted widely in multiple formats. You have print and online media now that span from a tall vertical shape to a sprawling landscape format. Many posters that I do now have to be painted in layers so the components are adaptable. It’s not the same to paint an image as a silhouette as it is to incorporate it into a background. Some of the magic is lost when art is made that way. It can have a very cut-and-paste look, even with all the effects available with photoshop editing. Derrick: Jurassic Park has not been the only time you have depicted dinosaurs. 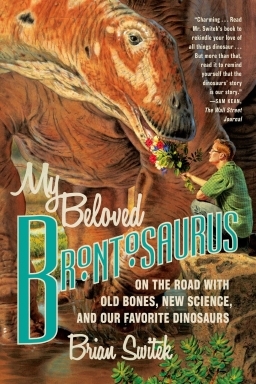 You provided a book cover featuring a Brontosaurus in My Beloved Brontosaurus by Brian Switek, and other various promotional materials over the years. I take it you’re a big fan of dinosaurs? Or you’ll just draw whatever comes your way with even just a small level of interest? Mark: I’ve always loved the dinosaur. The cool thing is that they are like a fantasy creature only they are real! It’s easy to forget that they once actually roamed the Earth because they are so fantastic. Then you see a creature like an alligator or a turtle and it’s easier to imagine this world covered in crazy oversized monsters. My favorite thing to draw and paint are things that are living. Whether it’s animal, human, or in-between, as long as it’s alive, or dead, I enjoy those subjects. I’ve never liked painting still life or even landscapes, unless there’s something living as the focal point. I guess it’s because without presence of life, I struggle to connect. Because I work on assignment, my job is to make whatever I’m working on interesting to me. I don’t want to ever be in the middle of painting something and be disconnected or wishing it were over. Each piece I make should be like giving birth; without the pain. Derrick: What are some new projects you have coming up? Mark: I’m not able to discuss most new projects because of confidentiality, but some recent published projects include the new Broadway shows for CLINTON: THE MUSICAL, SOUND OF MUSIC, and FIRST WIVES CLUB. TRAVEL magazine covers, book covers, and playing cards for David Blaine [as well]. I’m working on a new major food brand that will hopefully come out this fall. Each day is a new adventure. Derrick: What has been your favorite piece, or the one you are most proud, out of everything you have worked on so far in your career? 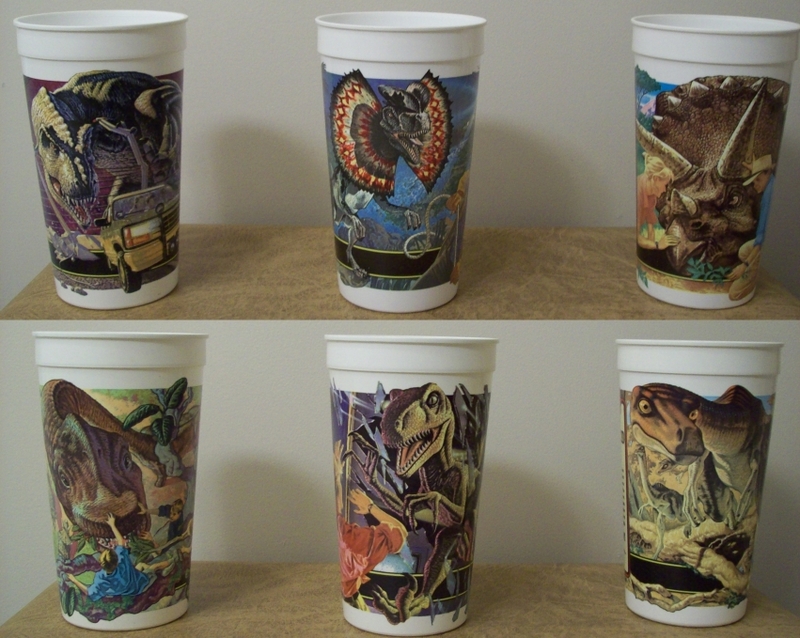 So thanks to pure luck, his personal works for the Jurassic Park cups were restored in full. I couldn’t be happier to have had a hand in making that happen. 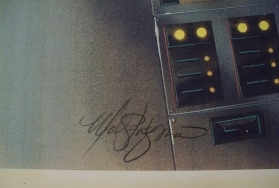 I also can’t help but gush with a childlike glee that I possess a rare artifact from the days of marketing the film such as this (and, even more happily, even got it signed by the man who made it). Especially since this was, oddly, the one cup I never got to get a good look at as a kid, and felt taunted about it until I was an adult and finally bought a set. Velociraptor is my favorite dinosaur, after all. I don’t mean to boast! It’s just the six-year-old version of me back in 1993 would have never guessed such a full circle would have ever happened. I’d like to personally thank Mark Stutzman for his time and his talent. To check out more on Mark Stutzman and his amazing work, along with his wife, visit his website below, or follow on Twitter. Derrick Davis is an aspiring writer and long-time Jurassic Park fan. He is the creator of the Jurassic Time: A Memoir Of John Parker Hammond, featuring Richard Attenborough’s dialogue from Trespasser. He is currently writing a novel with a premise that involves alternate universes, including some dinosaurs. 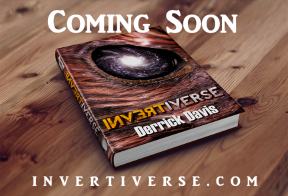 Check out the website for more information, including Facebook and Twitter links at Invertiverse. That is some very cool artwork. Have always envied people with such talent.